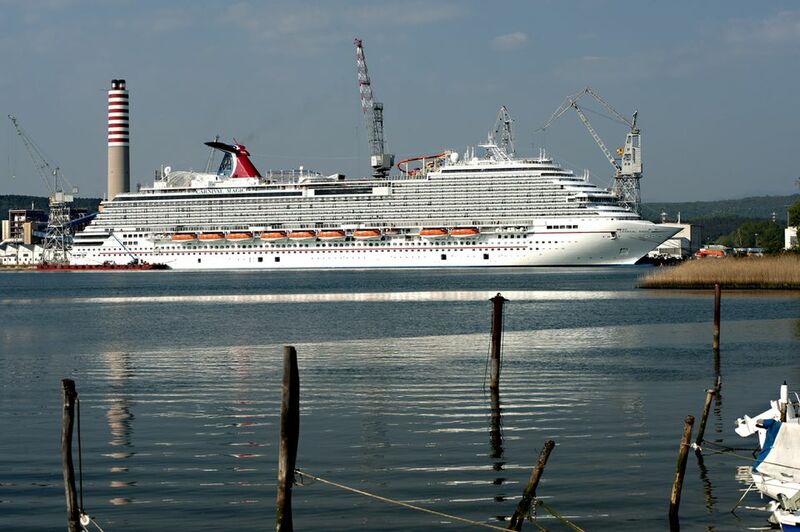 The 130,000-ton, 3,690-passenger Carnival Magic was launched in Venice in May 2011. She was Carnival's 23rd ship and Carnival Corporation's 100th. Mainstream cruising sure has come a long way in size, as is seen in this picture comparing Carnival's first ship with the corporation's 100th. What doesn't show in the picture is how much the onboard experience and amenities have improved over the past 40 years. The Carnival Magic sails seven-day cruises year-round to the Caribbean, Bahamas, and Mexico from its home port in Port Canaveral, Florida. This review and photos are from the inaugural 9-day cruise from Venice to Barcelona. The company's goal is to factor in "fun" and "memorable" when designing a new Carnival ship. The Carnival Magic is a great ship and fits Carnival's "fun ship" and "memorable" theme perfectly. Carnival executives know their primary target market is middle America, and this ship is geared towards the type of memorable cruise vacation North American families and couples are looking for--social, fun, affordable, unpretentious, and good value for their vacation dollar. They've certainly succeeded with this ship. The Carnival Magic is much like her sister ship the Carnival Dream launched in 2009, but has a few interesting differences outlined below that are discussed in more detail further in this article. Let's take a detailed tour of the Carnival Magic. The Carnival Magic features many favorite dining venues that past Carnival cruisers recognize. In addition, the cruise ship has two exciting new dining options that have quickly become guest favorites. The first new venue was an overnight success from its first sailing. The RedFrog Pub is Carnival Cruise Line's first onboard pub. Located on deck 5, the RedFrog has both indoor and outdoor seating for 120 guests. Its theme is a mixture of the Caribbean and Key West, with palm trees and decor straight out of a beach bar. Although the inaugural sailing was in the Mediterranean, this laid-back cruise ship definitely has a Caribbean feel. The RedFrog serves Caribbean-themed pub snacks such as coconut shrimp, chicken wings, Bahamian conch salad, and fried grouper fingers. Yummy, and a perfect lunch, snack, or light dinner. The pub also has live music that fits the Caribbean theme and a wide selection of island beers, frozen libations, and rum drinks. Carnival has brewed its first private-label draught beer especially for the Carnival Magic, called Thirsty Frog Red. As you might expect, Thirsty Frog Red is red in color and has a very slight fruity taste. Very tasty. Carnival has made excellent use of the space over the Lido Marketplace, adding an Italian family-style dining venue called Cucina del Capitano ("The Captain's Kitchen"). This traditional Italian restaurant, with its red and white checked tablecloths and kegs of Chianti, pays homage to Carnival's Italian heritage. Past Carnival cruisers already know that all of the line's captains are Italian and many Carnival ships, including the Carnival Magic, were built in Italy. The menu consists of made-to-order Italian favorites developed by the cruise line's executive chef and four chefs de cuisine who spent three weeks in Italy researching and eating with some of Italy's finest chefs and their families. Those who don't like Chianti can choose from a wine list specializing in Italian vintages or one of the specialty cocktails such as a Limoncello Martini designed just for Cucina del Capitano. Meals at Cucina del Capitano are casual and fun, featuring homemade pasta and other Italian specialties. Some recipes come straight from the Captains' (or their wives') kitchens. Most diners love two other elements of this restaurant. The first is all the old captioned-photographs lining the walls. Most of these pictures either came from Carnival's archives or from the personal collections of Carnival's current or former captains. The second is the warm service, touched with fun. The waiters serve Chianti from rolling kegs and entertain the diners with lively songs. Carnival hasn't changed all the restaurants on the Carnival Magic, continuing with two large main dining rooms, Northern Lights (midship on decks 3 and 4 with 948 seats) and Southern Lights (aft on decks 3 and 4 with 1,248 seats). Dinner is served at two fixed seatings (6:00 pm and 8:15 pm) or with anytime dining between 5:45 and 9:30 pm. Dinner usually includes six appetizers and soups, two salads, and six main courses. Also offered are traditional selections like Caesar salad, shrimp cocktail, grilled flat iron steak, grilled chicken, and gourmet burgers. The dessert menu also features six selections, including a Carnival favorite--the Warm Chocolate Melting Cake. Carnival still has its classic alternative Prime Steakhouse on the Carnival Magic. This room is elegant and has a great atmosphere. If you like beef, lamb, or lobster, you will love the Prime Steakhouse. Located aft on deck 5, this contemporary steakhouse has prime beef ranging from a 9-ounce filet to a 24-ounce porterhouse. Those looking for a "lighter" meal can enjoy the fish or chicken. The side orders are huge and delicious, with wasabi mashed potatoes and sauteed mushrooms table favorites. Although Prime has a surcharge, it's a great place for a special meal to accompany your unforgettable cruise vacation. It only seats 69, so get your reservations early. Those looking for another unforgettable experience might choose to experience the Chef's Table in the galley. Eight to twelve guests get to savor a special menu that begins with a champagne and canapés cocktail hour, followed by a personal tour of the galley in operation, and a seven-course meal with wine pairings. This one comes at a steep price but would provide some great stories to take back home. The Lido Marketplace offers international flavors at breakfast, lunch, and dinner. Almost every type of cuisine is offered on one day or another, including Italian, Asian, Tex-Mex, tandoori, and all sorts of deli sandwiches and salad-fixings. Pizza and frozen yogurt are available 24-hours a day. On sea days, Carnival Magic's outdoor Lanai area on deck 5 transforms into an on-deck barbecue, dishing up grilled items such as sliders, chicken, and hot dogs. Salads, homemade chips and salsa, quesadillas, and traditional barbecue accompaniments are also included. Also on deck 5 in the Ocean Plaza is the Plaza Cafe, a patisserie serving specialty coffees and sweets such as baked-on-board cakes, pies, and cookies for a nominal charge. The Plaza Cafe also has freshly made milkshakes and premium ice cream. With both indoor and outdoor seating in a central location, this is a busy hub of the ship. One of the most popular places late in the afternoon on deck 5 near the Ocean Plaza(from about 5 pm to 8:15 pm) is the sushi bar with complimentary freshly-made sushi. The Carnival Magic also has complimentary 24-hour room service with a selection of sandwiches, salads, and snacks. Everyone seems to enjoy the outdoor deck areas of the Carnival Magic. The SportSquare area on the top deck aft offers guests the chance to try the cruise industry's first ropes course, aptly named the SkyCourse. The 230-foot ropes course has 20 bridges, each named for a Carnival home port city; 10 distinct elements; and 20 different activities over two different loops, an inner basic loop and an outer more "challenging" route. Both looked very difficult and a little too thrilling, although participants wear a safety harness while traversing the nets, ropes, and bridges. The course was busy day and night, and the thrill-seekers have a great view of the ocean far below. Participants are checking out the view while resting between activities and elements. Seeing the smiles on kids' and grown-ups' faces shows they were having a good time while improving their balance, coordination, and confidence. It's certainly a great activity for families and up to 1400 people per day can use the course. Also in the SportSquare complex are a miniature golf course; outdoor weightlifting area; a Vita exercise course with machines and stations; a lighted multi-purpose court for basketball, volleyball and soccer; and ping pong and foosball tables. Circling the entire area is an eighth-mile jogging track with great views of the sea and all the people enjoying the SportSquare activities. A full bar with a large flat-screen display is available for those who just want to relax and check out the sports action in the area or on TV. The outdoor decks on the Carnival Magic include the WaterWorks aqua park with its exhilarating (or terrifying) 312-foot spiral "Twister" and "Drainpipe" water slides, as well as an Aqua Play splash park for youngsters and their families. One new feature of the splash park is the "Power Drencher", a gigantic, 300-gallon "dump bucket". The bucket slowly fills before tipping on its side and making its own waterfall. Don't worry, no one gets 300 gallons dumped on their head--a bell clangs just before the bucket dumps, and a large tray spreads the water out amongst several areas. People loved it, although bah-humbug me thought the ringing bell a little annoying. Forward on the top deck is Serenity, the adults-only quiet area, with plenty of very comfortable chaise lounges, hammocks, barrel chairs, umbrellas, whirlpools, and a full-service bar. Serenity also has two large whirlpools. The Lanai on deck 5 is a half-mile outdoor promenade encircling the Carnival Magic, with easy access to the Ocean Plaza, RedFrog Pub, and other indoor areas of the ship. The Lanai also has seating and wind deflectors, making it a pleasant place to sit even on windy days. Four cantilevered whirlpools extend out over the sides of the ship, providing a relaxing place to watch the world go by on the Lanai. The interior decor of the Carnival Magic is bright and fun, although not quite as over-the-top as some previous Carnival ships. Principal designer Joe Farcus seems to have gone for a slightly more subdued look, which Carnival guests still love. Don't worry, the cruise line hasn't sacrificed one bit of fun, with some memorable touches. The central atrium/lobby area is gorgeous, terrific lighting and multi-deck glass elevators soaring towards the overhead skylight. The guest relations desk and shore excursion desk are on deck 3, along with a large dance floor. A small bandstand, where live musicians perform night and day, is suspended over the dance floor. Guests can lean over the railing on all the decks above and listen to the music and watch the action below. On deck 5 surrounding the atrium are the retail shops. Most of these are like those on other ships--Carnival-branded merchandise, clothing, jewelry, liquor, perfumes, etc. However, one new retail shop is going to be very popular with the kids--Cherry on Top. It's more than bins of colorful candy in a candy store, although that's the most eye-catching feature when you enter the shop. The Cherry on Top shop also has cute gifts, cards, and flowers, all designed to make a special person in your life feel even more special. The thousands of kids sailing on the Carnival Magic also appreciate the 19,000 square feet of space dedicated just to them. Camp Carnival caters to those 2-11; Circle C is for the 'tweens ages 12 to 14, and Club O2 is for the older teens ages 15 to 17. Each group has its own set of counselors, own space, and age-appropriate activities. Parents of young children appreciate Carnival's Night Owls program on the Carnival Magic. This is an enhancement of the cruise line's babysitting service and is on all Carnival ships. Adults also appreciate the 22,770 square-foot Cloud 9 Spa, with its combination of fitness, wellness, workout, and personal-pampering spaces. The space is quiet and soothing, and the thalassotherapy pool, treatment rooms, and thermal suites are especially great for unwinding and ridding the body of tension and stress. The fitness facility has all the latest equipment including treadmills, bicycles, fitness machines, spinning equipment, and ellipticals. The Hat Trick casino has all the popular table games and even some penny slots. A Carnival ship wouldn't be a "fun ship" without a wide variety of bars and lounges, and the Carnival Magic is no different. Many of the bars and lounges are on deck 5, and each has its own personality. The 400-seat Spotlight Lounge has a small stage and dance floor, making it perfect for comedy acts and Superstar Live Karaoke (with a live four-piece band and backup singer). The Play It Again Piano Bar is a popular spot; quiet when the pianist is not playing, but full of fun (and singing) when he is. Vibe is the name of the dance club, and everyone loves the lighted tables and purple mood lighting. Of course, you can find a drink at the RedFrog Pub or Ocean Plaza bars, both on deck 5. Deck 5 isn't the only place you can find a bar on the Carnival Magic. There are several bars on the pool decks, and the Magic Bar in the deck 3 lobby is a good place to people-watch or listen to the live music. The very quiet, small Escape Bar is tucked in a corner next to the Northern Lights Dining Room and the Books & Games library. The Carnival Magic has a large conference center area on deck 3 that can be used for meetings and weddings. Embracing modern technology, the Carnival Magic has dozens of "Fun Hubs" of computers scattered throughout the ship. The Fun Hub is a social network and shipboard Intranet portal that provides access to a variety of information on Carnival Magic's services, facilities, and daily activities. Carnival Magic also offers cell phone service and bow-to-stern WiFi, so those bringing along their own computers can access the Fun Hub and surf the Web from their own cabin or common area on the ship. The 1,300-seat Showtime Theater on the Carnival Magic has a huge stage, perfect for its three new production shows and for a wide variety of entertainment. The Showtime Theater is also used for bingo, presentations, and lectures. The 1,845 Carnival Magic cabins and suites are similar to the wide array of accommodations on the Carnival Dream. The cabins are a nice size, with plenty of storage. Families love the two-bathroom/five-berth cabins and the connecting staterooms. Carnival has continued the cove balcony cabins on deck 2 that have cozy balconies closer to the water line and the spa cabins that provide special access and benefits. Carnival has kept many of its guests' favorite venues on the new Carnival Magic, but also added some new ones that are sure to please its thousands of mainstream North American guests. Although the ship is primarily marketed to North America, we had an international group of guests on our Mediterranean cruise, including about 600 Russians. They all seemed to be having a great time, and it's fun to interact with people from different cultures and countries on a cruise ship. The Carnival Magic is a good fit for those who love big cruise ships and are looking for a fun and memorable cruise, filled with opportunities to socialize with other guests or with their own companions or family. It doesn't have as many alternative restaurants as many other newer ships do, but there's enough diversity of cuisine to satisfy anyone on a one- or two-week cruise.